We care about your passions, and so that you can transport your bike in total safety with the utmost care, we offer the new AmicoBlu motorcycle kit, which comes with an exceptionally good support system and automatic grip lock. 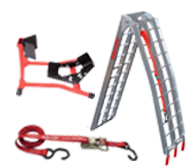 Its patented mechanism combines safety and reliability with strength and style. The up/down ramp is foldable, and is quick and easy to set up. Automatic clamp - Wheel stops - Pair of ratchet straps - Folding up/down ramp: length 226 cm - width 30 cm - load 400 kg. - Weight 7 Kg. The Motorcyle transport kit is available for only 25,05 Euro per day. Currently the kit is available at selected offices. Click here to discover the agencies where you can find the accessory "Motorcyle transport kit"